For years and years....actually, the entire time my children were growing up, we had a bonfire at my mom's house on the weekend closest to Halloween. We roasted hot dogs and marshmallows over a fire outdoors....and all the family came. I hope my children have good memories of that time every fall. We have since stopped that tradition at my mom's house but I think next year I will begin that tradition at my own home! Hmmm...never given it much thought. If I were going to get a tattoo, I guess I would make it visible....what's the point in having one if you are going to hide it? So, I guess the place would be next to my ankle. The tattoo would be Nonny....surprise! BUT, don't look for it...I'm past the tattoo days! Good Seasons Italian Salad Dressing. I put it on salads, tomatoes, sandwiches, bowls of veggies...you name it! I keep them in business! At a stoplight. Romantic, huh? He had the ring in a box under his seat and couldn't wait. Oh well, 37 years later I can say it didn't make a difference!!! Have a great weekend! Tell me, would YOU get a tattoo? its the spontaneous proposals that are the best. If I wasn't scared I'd get a boy dino near my heart, for my little man. That's cute that he couldn't wait. I don't think I'd ever get a tattoo either. I'm not a fan of self-inflicted pain. 1. I don't really have a fall tradition.....yet. 2. I would have 2 kids. 4.is avocado a condiment b/c i sure use it on a lot of things! 5.my husband proposed on my 20th birthday at my house in front of my parents, sisters, grandparents and our best friend. Loved your proposal story. I am not a fan of tattoos either. We have been having a weiner roast at our home on halloween for many years too. But the last few years have been hard to get everyone together. It was a special tradition with lots of memories---grandaddy always taking the kids for a ride down the road in the trailer behind the tractor and then everyone sitting around the fire laughing and talking. Family is the best. Glad you are going to carry on the tradition. After reading your proposal and thinking about my own...I have to agree that You are right--it really doesn't matter--37 years don't lie! Congratualtions! Visiting from 5QF. Hope you'll visit us soon! Hi sweet friend! I'm back to blogging! I might not post or visit as often as I used to, but I promise I'm back. Loved catching up with you. I can not imagine having a tattoo. I love having a boy and a girl but still might go for the third in a few years. Just writing that sentence gave me anxiety though so maybe two and through! I love the weiner roast and think your grandkids would love it!!! Our fall tradition is taking the kids to a pumpkin patch and to see the scarecrows. 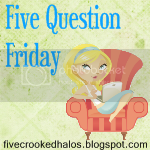 Love the 5 question Friday...Definitely will never get a tattoo.